We are one of the largest accident repair centres in Devon; we are Honda and Kia approved. 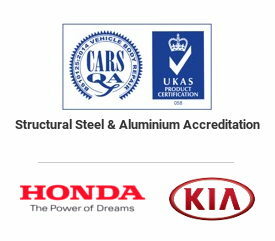 We specialise in aluminium structural repairs for various vehicles including Jaguar, Nissan, Audi, VW, Seat, Skoda and Mercedes. We provide quality customer service with a no-hassle promise, ensuring all of our repairs are carried out to our Kynaston’s Group Quality Standard. 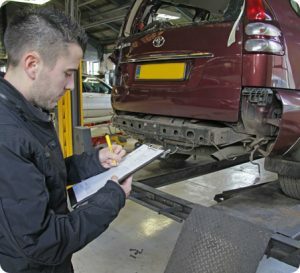 Kynaston’s understand that you want your vehicle to look up to scratch once its repair has been carried out, therefore we also have the facility to carry out smart repairs to give your vehicle that cosmetic showroom makeover before it comes back to you. We can offer you use of one of our very own courtesy cars whilst your vehicle is in repair so you can carry on with your life as normal. A collection and delivery service is also available for those customers in the local vicinity. We put the customer at the forefront of all of our work carried out here at Kynaston’s therefore each repair is tailored to the individual’s requirements. We proudly offer the latest management software to keep you fully up to date on the progress of your repair by email or text. Please contact us to book in your vehicle or find out more about the services we’re able to offer. Here at Kynaston’s we are proud that our dedication to training and quality has been recognised by many of the main car manufacturers. We are a Honda approved and Kia approved car body repair centre. We are also aluminium structural repair specialists for Jaguar, Audi, VW, Seat, Skoda, Nissan and Mercedes. Our trained technicians use the latest equipment and are committed to providing you with excellent customer service and quality workmanship. Our experienced technicians will repair your car to the highest standards using only genuine Honda or Kia parts and specialist paints. All repairs are completed to the manufacturer’s warranty. Additional services at reasonable rates are available on request and services can be tailored to an individual’s needs. These include a recovery, collection and courtesy service and a professional valeting service by our technician specialists.